Workbasket Wednesday – Diamond Lace Scarf – That's StitchTastic! 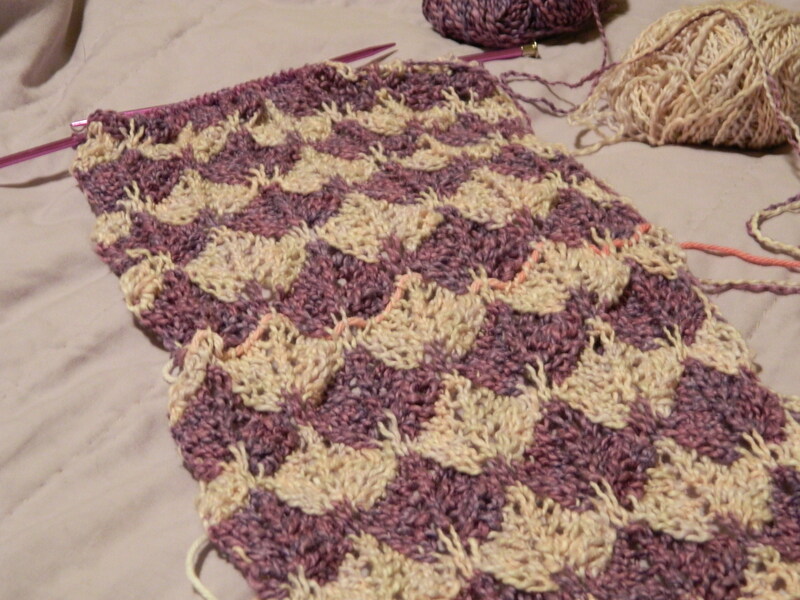 I am still working on my Cable Knit Scarf that I featured last week. Although I didn’t finish this past weekend like I was really hoping to, I am very close to the last few rows and binding off. Another project I am pulling out of moth balls to really focus on this week is my Diamond Lace Scarf. The pattern is actually called “Short Row Lace” scarf, by Iris Schreier. Iris is the wonderful lady behind ArtYarns who oversees the spinning of designer yarns and creating beautiful designs. I have several of her patterns on my wish list and my fingers are just itching to knit. The yarn is a yummy ArtYarns creation called CottonSpring in two different colors (of course). It is a thinner worsted yarn, I honestly think it is a DK weight yarn, that is made of a combination of cotton and wool plies spun together. The texture of this yarn did take a while for me to get used to knitting with, but since I got tensioning this yarn down, it really is a pleasure to knit with. I named it the diamond lace yarn because the short rows are actually forming diamonds, and the lacy effect of the yarn overs while creating the short rows really allow light to shine through when a breeze blows this scarf. So to me it almost glimmers like a diamond. This picture does not do it justice, but I wanted to try to show off the lacy effect within the diamonds. I started knitting this one almost a year ago and I am about 60% done with this project. I pick it up on the occasions that I actually have undivided attention to give this project. Creating the rows of diamonds require knitting each diamond individually using the short row technique. It is not that difficult, but the yarn is a little slippery and I don’t want to accidentally drop a stitch and loose it within the lacy yarnovers. So it is not worked on as often as I would like. I hope to have this one done by July, so I can wear it for my birthday. Share yours in the comment below! Until next time. Have a StitchTastic Day! Love the diamond scarf! 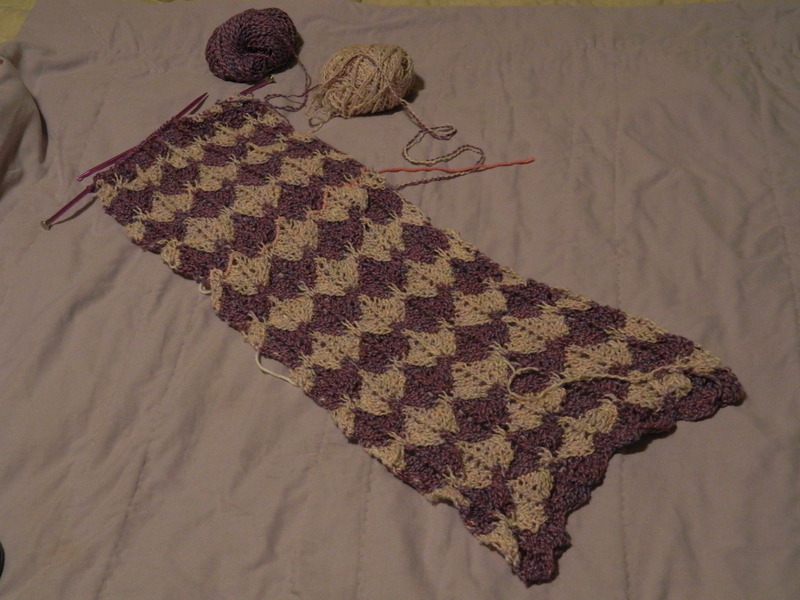 I have just started the Zig Zag scarf from Modular Knits. You will love that scarf! I have not knit it yet, but it looks so much fun! Pingback: Something Old, Something New….. « That's StitchTastic! Pingback: Lifelines – Part Deux (or Now That We Have Them What Are They For?) « That's StitchTastic!